The words I’m a feminist but… recur like a refrain in this ‘beginners’ guide to feminism’. Sometimes they come from the author herself, sometimes from her sources. Now it’s my turn. I’m a feminist but I wish sisters wouldn’t keep volunteering the information that they feel ‘guilty’ about some (in their opinion) less-than-feminist aspect of their own personal behaviour. Whether it’s wearing make-up or high heels, enjoying romcoms or masochistic fantasies, disliking their bodies or allowing themselves to be ‘given away’ by a man at their weddings, I can’t help wondering why, if they feel that bad, they don’t just stop. Or at least keep quiet about it. It’s almost as if they want to be judged. But any feminist worth her salt who judges them will then feel guilty for being judgemental. So when I saw that Deborah Frances-White was publishing a book called The Guilty Feminist I approached it with caution. I’ve never met her, but I have enjoyed her stand-up comedy and warmed to her persona on BBC Radio 4. What if I didn’t like the book? Might I not feel a bit, well, guilty? I needn’t have worried. We have a lot in common. She was raised as a Jehovah’s Witness, and I had foureen years as a pupil at a Catholic convent school, so we both know about guilt. And whereas I can’t speak for Jehovah, I know that the version of God the Father with whom I grew up is big on rules, and penalties for those who disobey them. With God the Father, you know where you are. I’m a feminist, but I don’t do social media. That sort of thing reminds me why. 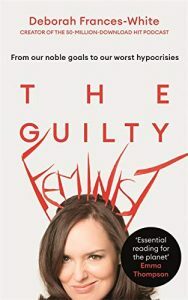 Deborah acknowledges that some feminist guilt is appropriate: ‘It’s harder to be a black, queer, broke, deaf woman than it is to be a rich, straight, able-bodied, middle-class white woman, and if feminism doesn’t address that, then it’s part of the patriarchy.’ Also part of the patriarchy, in my opinion, are those women and men who are free to vote in elections and referenda but don’t bother – and then complain about the choices made by those who did vote. On a practical level she urges feminists to spend less time on guilt and more on practical remedies: give money if you can, join groups, improve your speaking and writing skills. Remember the doors that were opened for you, and open them for other women. I’m doubtful about her suggestion that as women we should grab any opportunities that come our way to speak as experts, even if we are not. It would indeed be a way of getting more women’s voices heard – but what would be the point if the so-called expertise being displayed, is fake? Despite moments of ponderousness and opacity, this is a feel-good book. Its final exhortation is that we are allowed to cry, but that doesn’t mean we have to. We can hope and achieve and enjoy. The book doesn’t have all the answers, but it uses a cheering tone to ask the questions. I am a feminist and I’m glad we’ve got people like Deborah Frances-White on our side.